This perfectly-preserved panel represents the Adoration of the Christ Child. The Virgin Mary occupies the foreground space, kneeling and with her hands joined as she gazes tenderly at her Son. Jesus is on the ground, supported by an angel who steadies him by the shoulders, while a second angel, his arms crossed across his chest, watches his companion from the side. Behind them, on the right, is Saint Joseph, overtaken by sleep. The scene takes place in front of the hut of the Nativity, its thatched roof supported by piers made of bricks, their surfaces reflecting the light. Beyond the Holy Family, in the distance, a deep, partly wooded landscape opens out, over which a flying angel in a fiery wheel announces the birth of the Saviour to the shepherds seated on the hillside. In 1906, when the painting first appeared in the literature, it belonged to the collection of the Königliche Museum in Berlin; by 1934 it had been transferred from there to the Gemäldegalerie im Schloss in Königsberg. During the Second World War the castle was bombed and partly destroyed, and in 1945 the German city was annexed to the Soviet Union and renamed Kaliningrad. The art collections were dispersed and the castle was entirely demolished and replaced by the House of the Soviets, a structure that was never completed. The painting resurfaced on the London art market in the 1990s. Attributed in the past to Benozzo Gozzoli, as is clear from an inscription on the back of the painting, it is recorded in the catalogues of the Königliche Museum in Berlin published at the beginning of the twentieth century as by Cosimo Rosselli, whose authorship has been confirmed in all the subsequent literature. The subject of this painting enjoyed enormous popularity in Florence during the second half of the fifteenth century. Rosselli treated this iconography on a number of occasions, painting several variants of the composition: these include the panel in the Musée d’Art et d’Histoire in Nice, similar in design to the painting before us; the Adoration in the Muzeum Narodowe in Wrocław, Poland, where the young Saint John the Baptist takes the place of the angels; and the panel in the chapel of the Medici Villa at La Petraia, north of Florence, in which the figure group is reduced to the Holy Family. 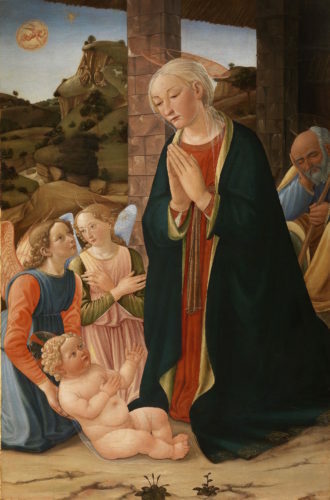 Our Virgin Mary closely resembles her counterpart in Cosimo’s Adoration of the Magi in the Uffizi Gallery, regarded by recent scholarship as a work produced about a decade after the later 1460s, its traditionally accepted date. The figure of the angel to the left of the Virgin, who kneels with crossed arms as he gently turns towards his companion, shows a clear awareness of the Baptism of c. 1475 painted by Andrea del Verrocchio for San Salvi, now in the Uffizi Gallery. The reference to this celebrated work, which is also cited, though in reverse, in the Virgin and Child and Angels in the Metropolitan Museum of Art in New York, provides a useful terminus post quem for the dating of our painting – that is, the second half of the 1470s, before the grand Sistine Chapel project in Rome (1481), where Cosimo Rosselli worked alongside the most important figures in Florentine painting of that period.